In Spanish we have learnt our colours and numbers. We know how to say hello and the days of the week. Also we have Learnt the months of the year. I have enjoyed our Spanish lessons. 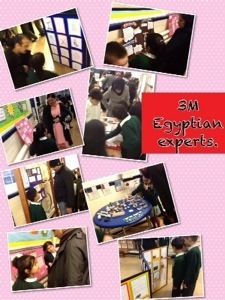 At the Egyptian museum we made posters about pharaohs, clothes, pyramids and temples. We also made clay mummies and coffins. 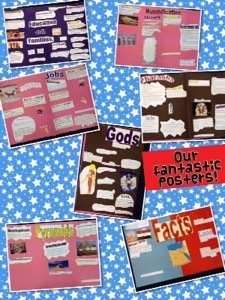 Our fact files were put on boards for our moms and dads to see. My mom came to the museum it made me happy. Today was a really good day because all our mums and dads came in to our museum where we got to show off all of our learning from our Night at the Museum topic. I liked having the adults there to show them our work. 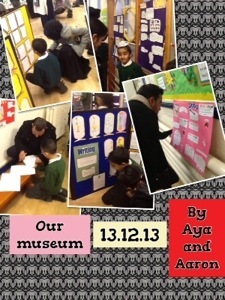 Y3 have been working hard in our topic Night at the museum. Our parents came to our amazing museum to see our lovely work this morning and we explained to them how we had been independent learners this half term by organising our own learning. We also made our clay models of the artefacts some of us made a head rest, canopic jars or lots of other models. We also did our project about Gods , Mummification , Pharaohs pyramids . Today we have shared with our parents all of our facts and our projects. 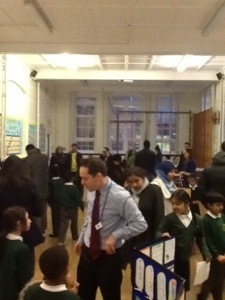 We not only showed are parents we also got to sharing our learning with year 4, year2 and year 6 . Parents thought this museum was fantastic.